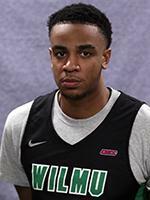 For the first time in his career, men’s basketball’s Jordan Harding (William Penn) received CACC Rookie of the Week for his performances on the court this past week. Harding helped the Wildcats to a 2-0 record by defeating Chestnut Hill 81-59 last Tuesday and Post in overtime, 100-94, on Saturday. The freshman forward averaged a double-double in the contests, averaging 21.5 points and 12 rebounds. Harding scored 20 points and grabbed 10 rebounds against Chestnut Hill, while shooting 58 percent from the floor. He also scored a career-high 23 points and grabbed a season-high 14 rebounds in the Wildcats’ OT win over Post. The forward went 5-8 from behind the arc for a 62 percent shooting percentage. He averaged a shooting percentage of 56 percent from the three-point line and an average of 55 percent from the floor throughout both contests. He finished both games playing 75 minutes on the week. Harding is currently fourth in the CACC shooting 42.5 percent from behind the arc. Thomas Farrior and Jermaine Head were named to the Honor Roll for their performances. Farrior averaged 27.5 points in both contests after scoring 24 against Chestnut Hill and 31 against Post. He also grabbed 17 rebounds throughout both games. Head averaged 25.5 points per game after scoring 26 against Chestnut Hill and 25 against Post. The red-shirt junior pulled down 18 defensive rebounds, while dishing out eight assists, three blocks, and making four steals.